Commit to paying attention when women speak during meetings and conversations. Make a commitment to actively encourage women to offer their thoughts, ideas or opinions at meetings you attend during the 16 days campaign. 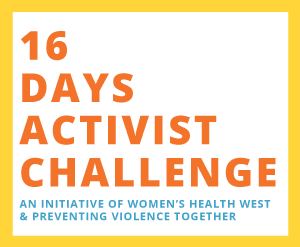 You might also keep a ‘talked over tally’ during the 16 Days of Activism, noting the number of times you witness women being interrupted or talked over by men during meetings, conversations or discussions. Take the approach employed by women staffers of the Obama administration, to ‘amplify’ women’s voices whenever possible. During conversations, be aware of the types of interruptions made by men (and women). For example, Joanna Richards’ recent study of interruptions in the Australian senate found that, while women in this context actually interrupted more times than men, their interruptions were usually in defence, or positively in support of another female speaker or a less powerful speaker, whereas almost 75 per cent of the male interruptions were negatively trying to take power or take the floor from another speaker. Silencing, ignoring or minimising women’s voices is an aspect of sexism and gender inequality. Rigid gender roles and stereotypes equate masculinity with leadership, dominance and authority. Men are socialised to be decision-makers and voices of authority, while women are socialised to be submissive listeners and collaborators. Experts in male prevention of violence against women propose that ‘listening to women…is an alternative to using power and control tactics to silence them. Listening is thus a path toward justice’. Consider your bookshelf or university reading list. Are women well represented? If not, advocate for greater inclusion of women authors in course materials and make a conscious effort to include more women’s voices in your own reading. Give credit where it is due; acknowledge women’s contributions and ideas. Suggest a ‘no interruptions policy’ while women and men are speaking in meetings at your workplace or during classes. Call it out when women are interrupted in front of you; don’t stay silent. Get ideas for how you can support women’s participation in decision-making and leadership at work.